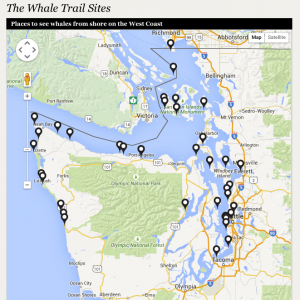 The Whale Trail is a series of sites around the Northwest where the public may view orcas, other whales and marine mammals from shore. The group’s mission is to inspire appreciation and stewardship of whales and our marine environment by establishing a network of viewing sites along the whales’ trails through Puget Sound and the coastal waters of the Pacific Northwest. In the San Juan Islands, there is a unique opportunity to watch killer whales from shore. “The Lighthouse is a center for ongoing orca research. It is also open for tours during the summer. As you leave the ferry, simply follow the ferry traffic by turning right as you get off the ferry ramp and take your first left (by the tree in the middle of the road) which is Spring Street. Follow this street through and out of town. Approximately one mile out of town you will see a street sign pointing to the left; this is Douglas Road. Turn left. This road will change its name after about 2 1/2 miles into Bailer Hill Road as it turns 90° to the right, but you will continue on this road for approximately another 7 miles. This road will lead you directly to Limekiln State Park, which is also known as the ‘Whale Watch Park’. San Juan Transit offers transportation around the island, serving Friday Harbor, Roche Harbor Village, Lavender Farm, Alpaca Ranch, San Juan Vineyard, Whale Watch Park (Limekiln Point State Park), English Camp, San Juan County Park, Lakedale Campground / Resort and 80% of the lodging facilities.